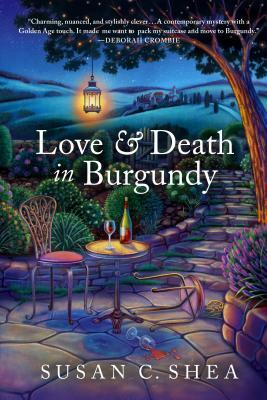 From critically acclaimed author, Susan C. Shea, comes Love & Death in Burgundy, an atmospheric mystery novel filled with good Chablis, french cheese, and, of course, murder. When the elderly Frenchman who lives in the village chateau is found dead at the bottom of a staircase, the town is turned into a hot bed of gossip and suspicion, and Katherine suddenly finds herself drawn deeper and deeper into the small town’s secrets. A motherless teenager, a malicious French widow, a brash music producer, and a would-be Agatha Christie are among those caught up in a storm that threatens to turn Katherine’s quiet life upside down. As more and more of the villagers' secrets are brought to light, Katherine must try to figure out who, if anyone, in the town she can trust, and which one of her neighbors just might be a killer. SUSAN C. SHEA spent more than two decades as a non-profit executive before beginning her career as a mystery author. Susan is past-president of the northern California chapter of Sisters in Crime and secretary of the national SinC board, a member of MWA, and blogs on CriminalMinds. She is the author of the French Village Mysteries, including Love & Death in Burgundy, and the Dani O’Rourke mystery series. Susan lives in Marin County, California and travels to France as often as she can.